The end of the year in particular felt like a bit of a non-event. 2015 was the best year for PC gaming in recent memory, if you ask me. Metal Gear Solid 5, Rocket League, The Witcher 3: Wild Hunt, Undertale, Cities: Skylines, Pillars of Eternity, Life is Strange and Rainbow Six Siege all came out within a 12 month period. In retrospect, that's a lot of influential and important games for a single year. 2016 was pretty fantastic, too: XCOM 2, Dishonored 2, Doom, Stardew Valley, Overwatch and Dark Souls 3 were the most notable. 2017, I would say, wasn't quite as strong overall as either, but still served up Total War: Warhammer 2, Divinity: OS2, Nier Automata, and What Remains of Edith Finch. I wouldn't say 2018 was a bad year for PC gaming at all, because it really wasn't. The strong choices in our now-completed GOTY awards and personal picks tell a story of a varied, exciting year, particularly in indie and mid-sized games. Into The Breach is already an all-time favourite, and I've spent hours of my holiday swearing at my poor tactical decisions, dead pilots and grid defence percentages. We definitely didn't struggle to fill all of our GOTY categories this year, which is a sign to me that PC gaming remains in fantastic health. For blockbuster games, though, I did think 2018 fell short. We had a few greats in our final list—the dependably exciting murder puzzles of Hitman 2, the long-awaited Monster Hunter: World, the series-best Assassin's Creed Odyssey, and the beautiful driving game Forza Horizon 4—but the only two games that the PC Gamer team even discussed for the ultimate GOTY prize were Into The Breach and Return of the Obra Dinn. I honestly thought the blockbuster game space could've been more exciting, particularly in the last three months of the year, which is typically when we see publishers bring their biggest and best. The disappointment surrounding Fallout 76 was a big factor in that. 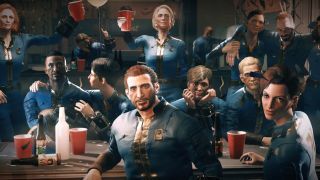 I wouldn't have predicted at the start of 2018 that a new Fallout game could bore me enough that I'd struggle to break the ten-hour mark, with or without multiplayer. Somehow, too, a new Metal Gear game came out earlier this year that no one really seemed to notice at all, which is the opposite of how that series is supposed to be received. And Battlefield 5, while as chaotic and entertaining as its predecessors according to Andy, seemed to me like its setting just didn't catch the same interest that WWI did in Battlefield 1 (we scored it ten fewer points). Plus, it had three different release dates on PC, which was a baffling choice to me. Monster Hunter: World is a great game, but it landed on PC over six months after its console editions did. Sea of Thieves finally showed us some benefits to the PC/Xbox ecosystem beyond Forza games, but that's taking a while to reach its full potential. I blame a few things in constructing this little moan at big, expensive games that are incredibly hard to make for hundreds of talented people. While the PS4 had a particularly strong year for exclusives with the likes of God of War and Spider-Man (I enjoyed the swinging and the story, less so the combat and the boss fights), I'm guessing that new consoles are arriving either next year or in 2020. I assume we're at the point where publishers are planning their multiplatform releases around that, which might represent something of an expected slowdown. The other factor to me is the enormity of Red Dead Redemption 2's release on consoles. Publishers probably wanted to stay out the way of Rockstar's monster-sized Western, which was sensible given its level of success. On PC, of course, the game doesn't have a confirmed release at all. Missing out on that had been on the cards for a long time, but it still meant there was this sense that some of the biggest things happening in games this year weren't always happening on PC. And that's so rarely the case these days. It doesn't help that some of PC's biggest series and studios had a relatively low-key year: a Total War spin-off and some Warhammer DLC aside, Creative Assembly's next big deal is Three Kingdoms. XCOM had a quiet 2018 as expected, aside from a small DLC pack, and Civ ticked a long with a new expansion (with another coming next year). We didn't hear anything out of Company of Heroes studio Relic, either, which is hard at work on Age of Empires 4. Amplitude, too, focused on DLC for its existing 4X games. These series arguably don't fit the 'blockbuster games' description, but their collectively quiet year means we saw fewer higher-profile PC-focused games than we normally would. Whether a result of Red Dead's release timing on consoles or not, the first few months of next year look exceedingly busy: Resi 2 Remake, Anthem, Metro Exodus, The Division 2, Sekiro, Devil May Cry 5, Three Kingdoms, among others. 2019 should start strong for triple-A games, even if the latter half is a near total mystery at this stage, a new Star Wars Jedi game, Call of Duty and the return of Doom aside. This is my gripe to see out the year, then: fewer blockbusters captured my imagination in 2018, and I don't think it's just me. These big games can offer exciting shared moments for PC players at their best, and I can't help feeling those years I mentioned at the start were better at creating these. This is entirely subjective, of course: maybe you played new Rainbow Six Siege content or Skyrim mods all year and didn't give a crap that Fallout 76 launched without an FOV slider or human NPCs. In which case, however you spent your 2018 with games, I hope you had a good one. Personally, I just hope I play something from a big publisher in 2019 that gets me as excited about games as Dishonored 2 or MGS5 did. That just did not happen in 2018, but those are incredibly high standards. What did you think of 2018's big games? Am I just being a grump? Let me know in the comments.